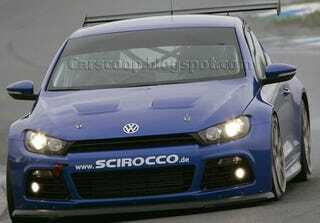 A lot of people think VW's upcoming Scirocco could use a little more oomph under the hood. The stock engines are rated from 122 HP to 200 HP, but this new version has a 300 HP version of the 2.0-liter TFSI inline-four. That's because the car has been race-prepped specifically for next month's 24-hour endurance race at the Nürburgring. Yep, this little fastback will be in the same race as the Gumpert Apollo Hybrid and the Lexus LF-A. Sadly, there are currently no plans for a version of the race car to hit the streets, but who knows. After all, the Aston Martin V8 Vantage N24 started life as a specially-built car for this same race just a couple years ago.